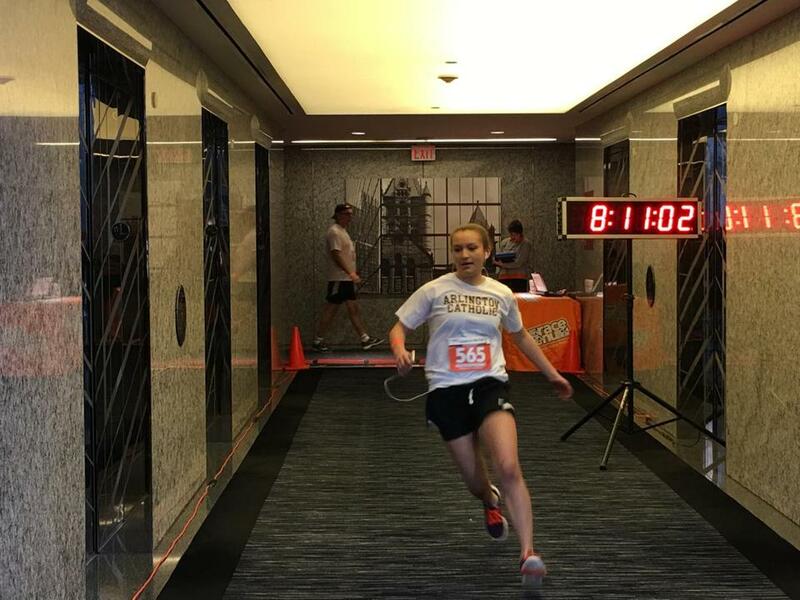 Winchester’s Heidi Santa Cruz, competing for the Arlington Catholic Cougars, races through a hallway during the 2017 Climb to the Top Boston fund-raiser at Boston’s 200 Clarendon Tower. Boston’s Kimberly Post was in a celebratory mood during the 2016 Climb . . . Anyone who has dashed up a flight of stairs after discovering the elevator is broken can appreciate the requisite effort. 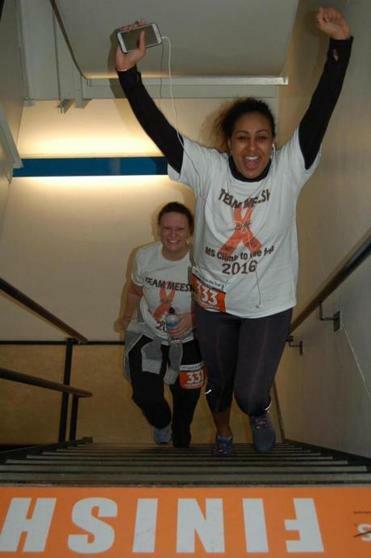 Now, string together 61 flights, or roughly 1,200 stairs, and you’ve got Climb to the Top Boston, a National Multiple Sclerosis Society fund-raiser at the 200 Clarendon Tower March 3. But what does it take to arrive on the top floor relatively unscathed, so you can enjoy the views?
. . . as were Randolph’s Maria DaSilva, in the foreground, and Needham’s Elise Bender. Monahan was diagnosed with multiple sclerosis, or MS, four years ago. The potentially debilitating disease attacks the central nervous system, disrupting the body’s internal information flow. For Monahan, battling MS means staying active. According to Lakeville’s Christy Burbidge, Monahan’s teammate on the Mindful Mountaineers, stair-climb events present distinct physiological challenges. Salem’s Dennis Levasseur, deputy chief with the Salem Fire Department, is one of many firefighters drawn to these events. He said he understands just how Burbridge feels. ■ Take the stairs instead of the elevator. Ask your apartment building manager for permission to use the stairwell or to do climb repetitions on several shorter flights of stairs. At the gym, rotate your workouts between treadmill and stair-climber. Boston-area residents can take advantage of the Bunker Hill Monument, which is open to the public and has 294 steps. ■ Try different workout options and see what works. Pace yourself, since stair climbing uses different muscles than running and you’ll be sore the next day if you don’t ease yourself into training. ■ Try climbing 8-12 flights of stairs, two steps at a time, at full speed, then rest/walk for 3-4 minutes (making sure you keep moving). Depending on your fitness, do four to 10 sets. Afterward, cool down for 10 minutes and stretch for another 10 minutes. Beverly’s Molly Andruszkiewicz, diagnosed with MS last year, described herself as a “casual weekend warrior.” She’s been following the society’s recommendations to prepare for her first star-climb event. MS patient Patrick “Batman” Garrett, an East Boston product now living in Derry, N.H., has ramped up the “difficulty factor” with each successive event he’s participated in. Next month’s Climb to the Top will be his seventh. 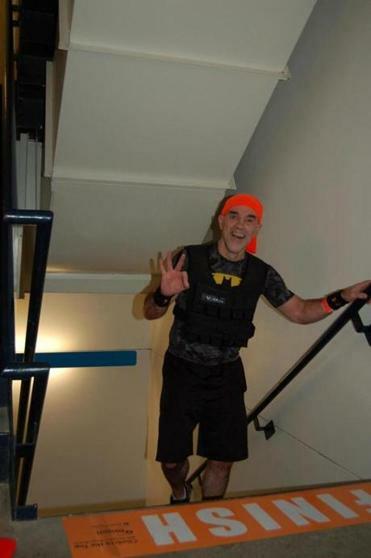 Last year, he did seven laps at Clarendon Tower, top-to-bottom, wearing a 100-pound weight vest for the first four laps. Likewise, Monahan sees a dual purpose in her participation. 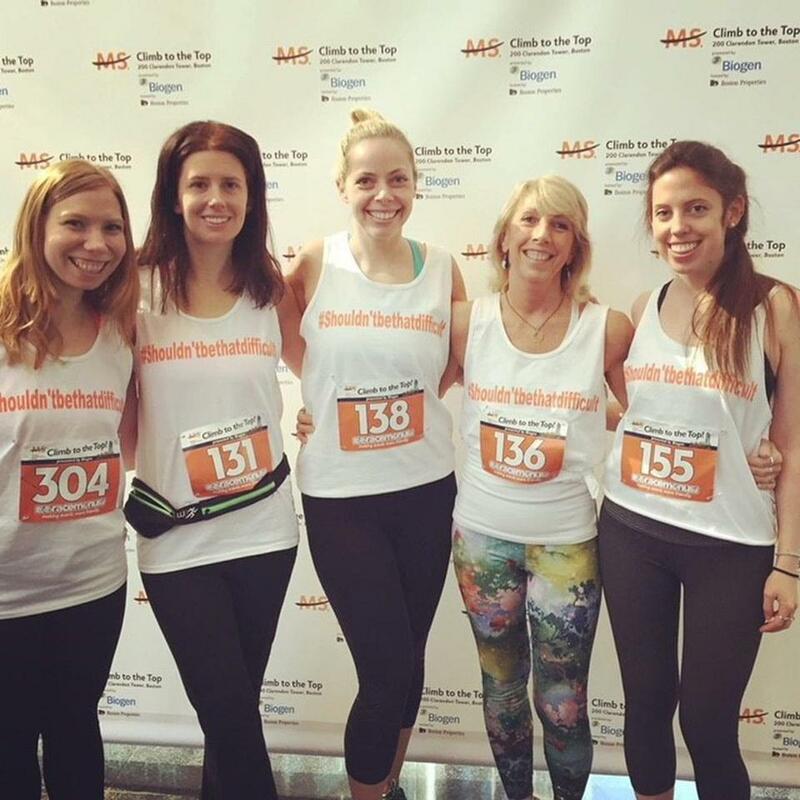 “Participating in Climb to the Top Boston – especially as someone who has MS – is one way I like to raise awareness of what multiple sclerosis is and how it impacts the lives of those affected,” she said. For others, the event is simply an opportunity to test their limits. Participants in the 2017 Climb to the Top event in Boston included, from left, Somerville’s Zanny Alter, Lakeville’s Christy Burbidge, Boston’s Cathy Maguire, Woburn’s Paula Keymont, and Watertown’s Hillary Monahan. 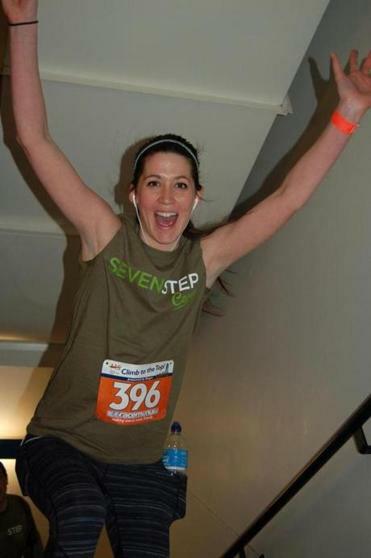 For details on Climb to the Top Boston, visit nationalmssociety.org, or call 1-800-344-4867. If you have an idea for the Globe’s “On the Move” column, contact correspondent Brion O’Connor at brionoc@verizon.net. Please allow at least a month’s advance notice.